If you’d like to jump in on this Bible study, you can go here to get the free study guide and all of the information you’ll need to get started. This week we start with a focus on Storge, which is defined as natural affection. 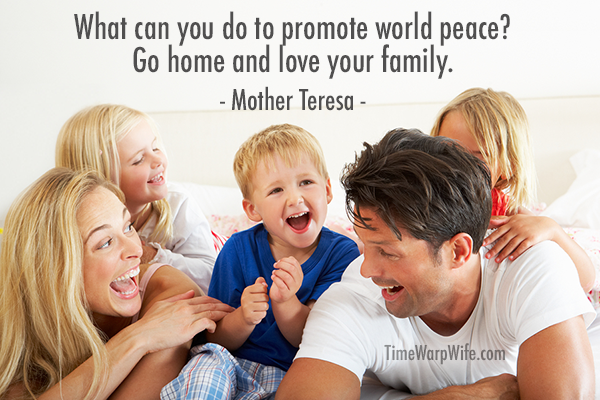 It’s the love you see between family members, and can also be found between friends that you love as though they were your own family. Storge is also used to describe the affection that animals have for their young and puppies have for their owners. Mama bears naturally protect, and dogs are affectionate to their pups. Other than the compound word, translated as “kindly affectioned” (Romans 12:10), the word itself isn’t found in the Bible, but many stories illustrate this kind of affection between family members. We see this throughout the Bible in stories like Noah and his wife who took their children into the ark. We see Mary and Martha who loved their brother Lazarus, we see Mordecai who adopted his niece Esther, and raised her from the time she was a child. C.S. Lewis writes about a link between familiarity and affection. The more familiar we are with people, the more affectionate we may become. There’s also a concern with familiarity that we should be aware of. When we get too comfortable with the people we’re with, we might take their presence, their affection, and their service for granted. It’s often said that people treat their friends better than they do their own family. And so we have to ensure that we don’t slip into bad habits like nagging, ignoring, or overlooking the goodness in them. This love should come naturally, and normally does, but circumstances can dictate otherwise. A child who is mistreated may lose respect for their parents, and in some cases relationships are severed. As you read through the scriptures this week (found in the free study guide), take note of the good and the bad. When we read about bad behavior in scripture we learn about our own selfish desires; when we see good behaviour we discover ways to improve. Maybe our selfish desires aren’t as horrendous as others you’ll be reading about, but we all have bad behavior that can be improved upon when we’re willing to examine our heart and allow God to change us. P.S. See the colouring page below? 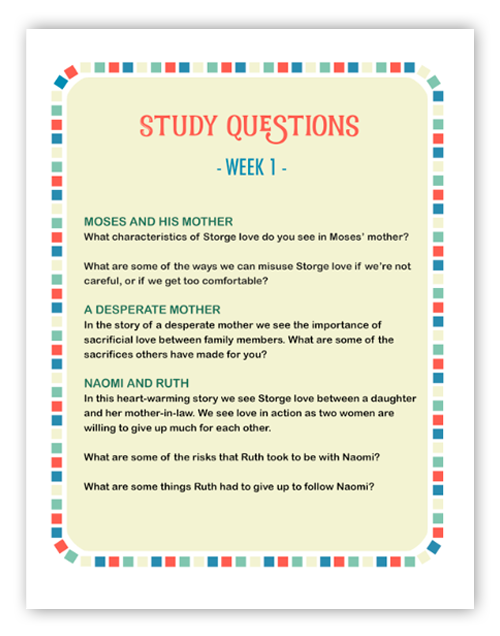 Come back here on Friday to continue our study on Storge. I’ll have another colouring page for you then! 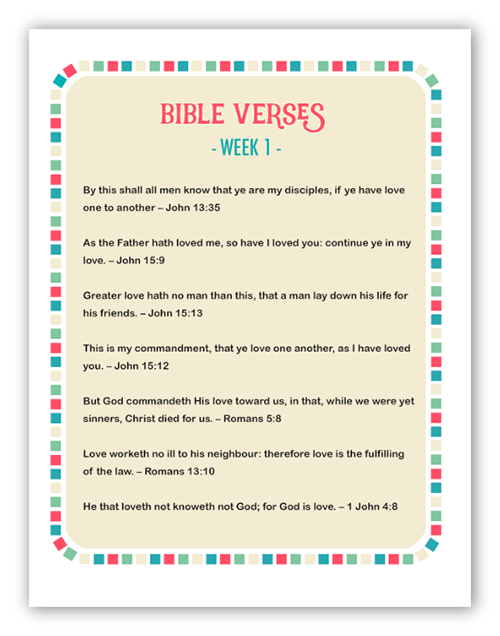 Click here to download this week’s Bible verses. 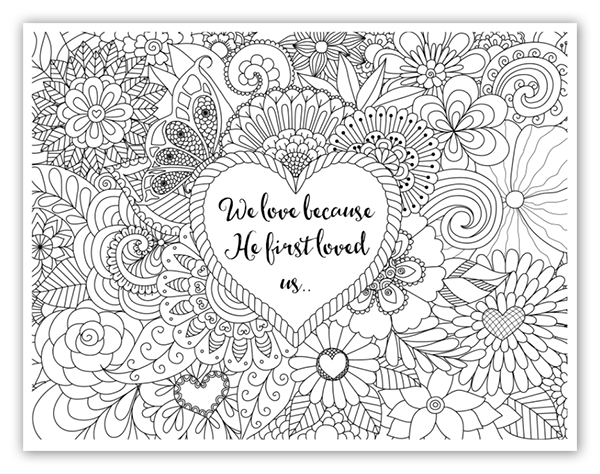 Click here to print this 8.5 x 11 colouring page. Come back on Friday for another one! Thank you Darlene. I pray your efforts will bless many. Thank you so much DD! Your words encourage me. Thanks Elena! I started our first lesson today .. such an easy read that has strong meaning behind it. I just started this study and I LOVE it already! LOL I especially love the coloring page that goes along with the study! Will there be coloring pages with each study. I love to color! Even considering purchasing one of the new coloring Bibles. There is colouring in the Quieting Your Heart journal. I’ll also have pages for you on Mondays and Fridays during the month of February. I hope you enjoy them! Thank you for this wonderful study. 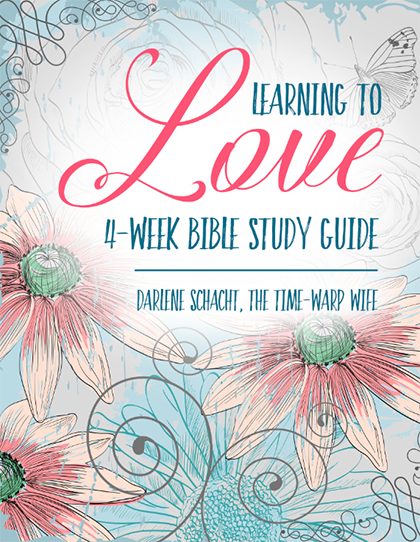 I am excited to study love through the bible. Great first lesson today..Great resources! I had planned to start this lesson this morning, but God had other plans. A family friend and co-worker for 21 years died last night. His wife notified me at 5:30 this morning. I instead spent the day trying to help her by introducing her to my Pastor (she is not a practicing Christian). I did this as she said to me ‘I wish I had someone to talk to that is not emotionally involved with what’s happening’. So instead I started the lesson at 8pm. To me it’s about loving someone even if you need to sacrifice something important. I am looking forward to this study and I’m looking forward to finding ways of introducing (subtly) this study and God to my friend. I’m not sure if this made any sense, but I know this study came at just the right time! Valerie, wow. I’m so sorry to hear that. I pray for peace and comfort to your friend and her family. I ask that God will help you to be an encouragement to her. Darlene, it is 4:06 on Tuesday morning and I am just reading your post. First let me say I am so glad your doing this study on God and love. I have just started in this group. I have a hard time studying the bible without the help of someone else. I have a personal relationship with God although I don’t go to church. I look forward to your study and hope it doesnt stop when February ends. I do so need this in my life and I think God sent me to this group because he knew it to. Thank You! I hope to do another study shortly after this one. I’m still working on my ideas. So glad you joined us!! Hi and God Bless You! This is going to be a wonderful study! Will the information in studies only be posted on Mondays and Fridays? or will you be posting new information daily? Thank you so much for this Study!!! Greetings! I look forward to offering your fabulous study to the staff here at The Salvation Army. I look forward to the “love” discussions this will provoke. Thank you for your giving heart. A lot of people want to study in pairs or in groups. I try to have discussion questions for that reason each week. The Bible verses are daily reflections. You can post it up somewhere in the house or in a binder and meditate on one each day. This is the first time i’m actually committing to a study bible and i think this one about love is a good way to start, sometimes it is so hard to understand the bible, so hopefully this helps me to have a better understanding. thank you for taking the time out to make this bible study happen i know its past from when you started but i have a small group that is going join to in with me. That’s awesome. I hope you enjoy it Lisbeth! Is there a place where we can read peoples’ responses to each of the sections? I know this sounds strange but I have always struggled with some of the interpretations and would love to read what other people have said or learned from each of these sections. Thank you for giving me something tangible to work on with God, I have also been struggling to find a way to spend more time with God and this gave me the opportunity to really be accountable, learn something that relates to me, and fellowship with others. Thank you again.